Following a two-year refurbishment, Aston Martin opened the Heritage Showroom in the 100 year-old Olympia Building, fitted with the classics workshop, a new car showroom and a club area for special events. The former aeroplane hangar became known as Olympia due to its similarity to the Olympia building in London, and it played an important role in the brand's life since Aston Martin's move to Newport Pagnell in 1957. It has fulfilled many functions over the years, including use as a machine shop, trim shop and as a service department. 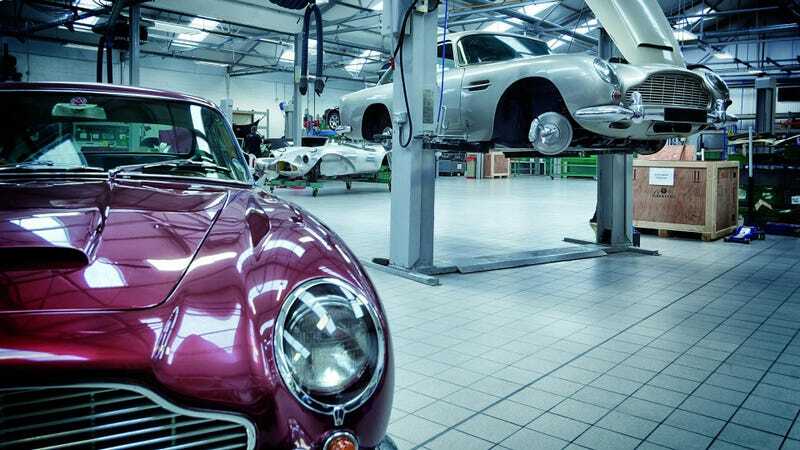 More recently, it was the panel shop and home to craftsmen restoring the bodywork of Aston Martin classics. Just like the bricks in the wall, Aston Martin is also a hundred years old in 2013, so giving the old lady an paint job was part of their centennial program. The greatest thing about the new facility is that while one is waiting for a replacement part made with the original factory bucks used when the cars were built here, there's a display of classic Aston Martins up to and including the DB7 to kill time with, not to mention the "discreet setting for customers to meet with the sales team." I wonder what happens there. Apart from the full service of any Aston Martin, the Heritage Showroom will also be used for events including film shows and owners club evenings. It's like Aston Martin's own Ace Cafe complete with the best garage you could ever dream of.